The Eureka EasyClean 71B is one of the best corded handheld vacuum cleaners for stairs on the market. Indeed, its specialty is to vacuum stairs and other inaccessible places with impressive power. The manufacturer is Eureka, a company founded in 1909 in Detroit. Manufacturers such as these pride themselves on building long-lasting relationships with customers. So they focus on budget, availability of spare and additional parts for their vacuum cleaners and customer care service. Most of their vacuum cleaners have powerful suction and are performance-driven. The Eureka Easyclean 71B model is no different. If you are environmentally friendly, you might want to keep your eye on Eureka vacuum cleaners. This company is part of the SmartWay Transport Partnership. This means they work hard on reducing greenhouse gas emission and pollution that happens during delivery of their vacuum cleaners. All in all, Eureka model 71B might be perfect for you. The Eureka model 71B is a handheld vacuum cleaner which is a special fit for stairs vacuum. But also for upholstery and car cleaning. This Eureka handheld vacuum is pretty light and easy to carry around and impressively easy to store. The reason for the Eureka EasyClean Corded Hand-Held Vacuum 71B light weight is that it’s mostly plastic, but pretty durable. The Eureka model 71b does great on the drop test. Due to its size, Eureka EasyClean Corded Hand-Held Vacuum 71B doesn't have a bag. That also means this Eureka 71b corded handheld vacuum fills up pretty fast, so you have to clean it often. The filter’s not as impressive as the suction power on this Eureka 71,. It gets clogged easily and frequently. Cleaning of the filter and the bag is quite a messy process, and probably the largest downside of the Eureka 71b. However, if you only use this Eureka handheld vacuum for dust and small or medium particles, as Eureka instructs you in the manual, this shouldn't be an issue. Eureka model 71B has 2 motors - one that powers the revolving brush and one motor for suction. You can control these motors with just an easy switch of buttons. This means that you can use both features at the same time, but also individually - depending on your needs. Also, the suction power on this Eureka EasyClean Corded Hand-Held Vacuum 71B is excellent for a Eureka handheld vacuum. The only minus is that this stair vacuum can be pretty loud. The River Visor is the star feature of Eureka EasyClean Corded Hand-Held Vacuum 71B. 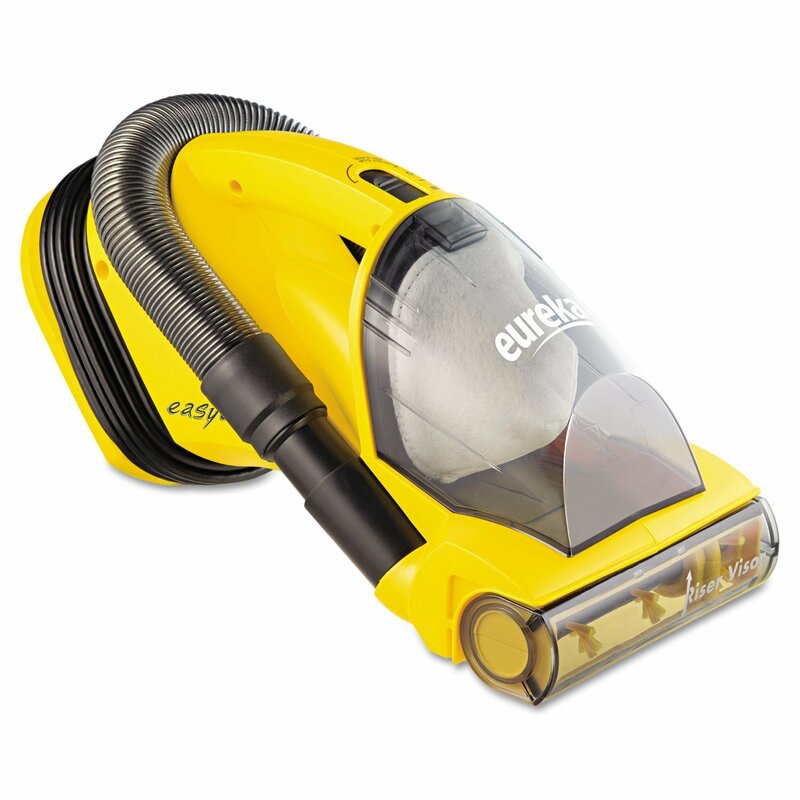 This is the feature that separates this Eureka model 71b from most hand-held vacuum cleaners. The Riser Visor is a clear, plastic cover that flips, so you can easily clean areas both vertically and horizontally. By flipping this cover, you reveal a revolving brush that picks up any dust or smaller particles. However, the power of suction and the brush rotation in Eureka Easyclean 71B make it difficult for the handheld vacuum to clean up larger particles. Sometimes it even scatters them around, so it creates additional mess. This feature is great for stairs vacuum and cars vacuum. If you stick with those areas, Eureka Easyclean 71B will work fine. Same goes for pet hair, although pet hair can clog the brush and the filters. Eureka Easyclean model 71B doesn’t do so well on contoured areas. That is why with this stair vacuum cleaner, you get a crevice tool. You can find the Crevice tool in the base of the Eureka handheld vacuum. It’s pretty easy to take out and place on the end of the hose, for cleaning the less accessible areas. It’s great for areas where the brush roll cannot reach. But you might find that the hose is a bit too short. The Eureka model 71B has a special thermostat that protects the handheld vacuum cleaner in case of motor overheating. That basically means that, if the Eureka Easyclean suddenly shuts off, you’ve either used it too much. Or it’s time to change the dust cup, to unblock the hose or filters. This is great as a safety feature. But this also means that you can't use this Eureka handheld vacuum for a prolonged period of cleaning. It's better to wait at least 30 minutes before using the stair vacuum cleaner again after overheating. This way, the Eureka 71b handheld vacuum can turn a tedious errand more tedious. The cord of this Eureka handheld vacuum cleaner is 20 feet. So if you decide to use it to vacuum your car, you might need an extension cord. Also, the Eureka model 71b doesn't have an automatic cord rewind. So you'll have to wrap it around the Eureka Easyclean. Eureka 71B dimensions at 15 x 7 x 7 inches make it easy for storage. The Eureka EasyClean Corded Hand-Held Vacuum 71B is pretty lightweight,. Only 4.8 pounds, which makes this Eureka handheld vacuum convenient to carry around as well. There are two motors at 5.5 amp power, to provide you with great suction power and a high-speed revolving brush. Based on customer reviews on Amazon this Eureka handheld corded vacuum cleaner has an average 4.2 out of 5 stars, with more than 7000 reviews. Eureka EasyClean Corded Hand-Held Vacuum 71B is currently ranked number 9 in Stick Vacuums & Electric Brooms Amazon category. The Eureka company offers a 1 year limited warranty for EasyClean 71B model. That means it’s free from all defects in material and workmanship in normal household conditions. However, you might want to register on Eureka’s website for a Direct Care Maintenance Pack Program. This program means that Eureka delivers bags, belts and filters directly to your door for a year every 6 months. This is based on average consumer cleaning usage. Eureka delivers the Eureka EasyClean Corded Hand-Held Vacuum 71B put-together, so there’s no hassle to assemble it. Also, as other products, Eureka will deliver this Eureka handheld vacuum cleaner with few or none non-biodegradable materials. The downside is that this Eureka model 71b is available for shipping from Amazon only to US, and not internationally. All in all, Eureka EasyClean Corded Hand-Held Vacuum 71B is your reliable cleaning partner. If you look for a corded handheld vacuum with low price and strong power, EasyClean 71B is a perfect buy. If you decide to buy Eureka EasyClean 71B, stair vacuum will be a trouble no more. And you'll have a highly economical bargain. Even if Eureka Easyclean model 71B doesn't fill all your needs as a handheld vacuum cleaner, the Eureka ecological management is a valid reason to buy Eureka EasyClean 71B. What about you - is ecological management of companies one of your concerns? Have you tried Eureka EasyClean Corded Hand-Held Vacuum 71B before? If you have, let us know what your experience was.